This was made for my best friend's baby shower; she has decided to not find out the gender until the birth. I used two packages each of NB and size 1 diapers. 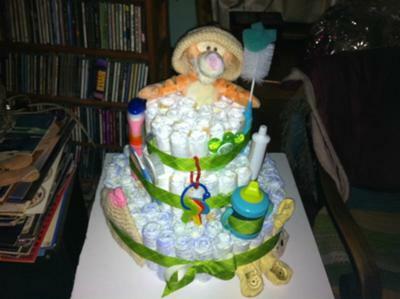 The center of the two bottom layers was a large bottle of baby wash, while the top layer is built around the Tigger rattle. I used a green plaid ribbon I got at Michaels around each layer and built a bow with scraps for the bottom.